A Chinese gold rush camp in Bright, a limestone quarry established by Dame Nellie Melba’s father and one of the world’s first mass concrete gravity dam walls near Geelong were all added to the Victorian Heritage Register in June. Gold was discovered in the new colony of Victoria in 1851. Some 200,000 immigrants arrived over a three year period including more than 45,000 Chinese. 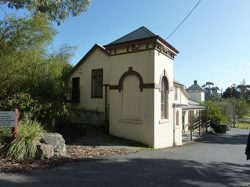 The Bright Chinese camp was established in 1859 as a response to anti-Chinese sentiment in the goldfields including the Morses Creek (now Bright) riot in 1859. Once established, the segregated camp flourished and included stores, a Joss House, hotel, gambling dens, lottery houses, a boot maker, opium dens, a Presbyterian Church and even a Chinese circus. It became one of the largest and most important Chinese camps in Victoria. In the late 19th century the camp fell into decline and by the early 20th century only one descendant remained. The Joss House was demolished in 1915 and all the remaining buildings in 1982. It is believed the Bright site contains many important archaeological records. There are few, if any, Chinese gold rush camp archaeological sites of comparable condition, size and significance in Victoria. The Cave Hill limestone quarry in Lilydale was established in 1878 by David Mitchell, one of Victoria’s most prominent 19th century entrepreneurs and Dame Nellie Melba’s father. The site demonstrates three generations of lime processing and was known for its use of innovative technologies. It was recognised as one of the leading industrial plants of its time in Australia and one of the primary sources of limestone in Victoria from its establishment until its closure in 2015. The Lower Stony Creek Dam (right) is Victoria and Australia’s first mass concrete gravity dam and the third such structure of its type in the world. It is a pioneering engineering structure built in 1873-4 and demonstrates a high level of technical achievement for the time. Built to service Geelong’s water supply, it underpinned Geelong’s development into a thriving city. It served as an international example to engineers all over the world at the time of its construction.